Coordonnateur : Brown Kenneth G.
With comprehensive coverage of topics related to learning, training, and development, this volume is a must-have resource for industrial and organizational (I/O) psychologists, human resource (HR) scholars, and adult education specialists. 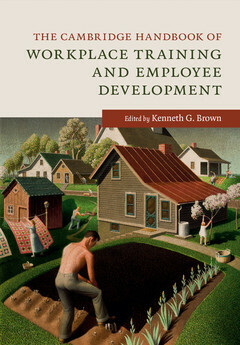 Brown provides a forward-looking exploration of the current research on workplace training, employee development, and organizational learning from the primary point of view of industrial organizational psychology. Each chapter discusses current practices, recent research, and, importantly, the gaps between the two. In analyzing these aspects of the topic, the chapter authors both present the valuable knowledge available and show the opportunities for further study and practice. 1. Introduction and overview: now more than ever Kenneth G. Brown; Part I. Fundamental Issues in Learning and Transfer: 2. Cognitive and neural foundations of learning Kurt Kraiger and Victoria P. Mattingly; 3. Facilitating the development of expertise: an individual to organizational perspective Alena D. Marand and Raymond A. Noe; 4. Understanding training transfer from the adaptive performance perspective Jason L. Huang, Shan Ran and Brian D. Blume; 5. The psychology of learner control in training: a multilevel, interactionist framework Garrett N. Howardson, Karin A. Orvis, Sandra. L. Fisher and Michael E. Wasserman; Part II. Understanding the Learner: 6. The role of abilities in learning and training performance Margaret E. Beier, Anton J. Villado and Jason G. Randall; 7. Taking charge of your own learning: self-regulation in training John J. Donovan and Jessica M. Nicklin; 8. Effects of genuine and perceived demographic differences in training and development Tracy C. McCausland and Eden B. King; Part III. Designing the Intervention: 9. Enhancing training transfer by promoting accountability in different work contexts: an integrative framework Michael J. Tews and Lisa A. Burke-Smalley; 10. Building deep specialization through intentional learning activities J. Kevin Ford, Jessica Santoro and Morgan Showler; 11. The science and practice of simulation-based training in organizations Shannon L. Marlow, Christina N. Lacerenza, Denise Reyes and Eduardo Salas; 12. Augmented reality systems in training Joseph R. Keebler, Brady S. Patzer, Travis J. Wiltshire and Stephen M. Fiore; 13. One (lesson) for the road? What we know (and don't know) about mobile learning Michael E. Wasserman and Sandra L. Fisher; 14. Time and thinking: an alternative to traditional learning and development activities Gillian B. Yeo and Sharon K. Parker; 15. Developing Latino talent Miguel A. Quiñones; Part IV. Special Topics: 16. Training and development in small and medium enterprises Melissa S. Cardon and Stephen D. Valentin; 17. Team training: knowing much, but needing to know much more Erich C. Dierdorff and J. Kemp Ellington; 18. Developing cultural intelligence Jana L. Raver and Linn Van Dyne; 19. Implications of positive organizational behavior and psychological capital for learning and training effectiveness Alan M. Saks and Jamie A. Gruman; 20. Rings of fire: training for systems thinking and broadened impact Anders Dysvik, Arne Carlesen and Miha Škerlavaj; 21. Rockstar vs ringmaster: balancing complimentary teaching roles to develop management skills Peter A. Heslin, Geoff Mortimore and Lauren A. Keating; Part V. Workplace Learning from Other Lenses: 22. Training from the perspective of human resource development and industrial-organizational psychology: common pasts, parallel paths – going where? Jon M. Werner; 23. Strategic training and development and their role in shaping competitive advantage Lynn A. McFarland and Robert E. Ployhart; 24. Hospitality training research: a review and implications for future research J. Bruce Tracey; 25. Informal learning Saul Carliner; 26. An operations management perspective on employee training and workforce planning Barrett W. Thomas, Mike Hewitt and Scott E. Grasman; 27. Workplace training from the sociological perspective David B. Bills and Herman van de Werfhorst; Index. Kenneth G. Brown is Ralph L. Sheets Professor of Management and Associate Dean of the Tippie College of Business at the University of Iowa. He is a fellow at the Society of Industrial and Organizational Psychology and the Association of Psychological Science, and a former Fulbright Fellow at Seoul National University in South Korea.